Music, of course, is highly subjective. I’m not here to convince you about the musical talent of Jack White and the White Stripes, this video of their performance on Conan can do that for me. While the band’s music made me a fan, what’s kept me interested is Jack White’s unique takes on creativity and business. There’s nothing subjective about business success. The band is curious for a couple of reasons: the whole husband-wife/brother-sister thing, there are only two members and the band’s monumental success at a time when the infrastructure of the music industry was crumbling around them. Likewise, White’s latest venture Third Man Records, is selling custom, hand pressed vinyl records and making waves in the music business. As a fan of White’s music I’ve probably read nearly every mainstream press attention he has received and Jack White’s thoughts on business and creativity have had a profound effect on who I am as a businessman. Below are some takeaways I’ve gathered and try to live up to in my professional life. What if it’s really good? The White Stripes have build a strong, but limited framework for their music and their business. Much like good business can boil down their messaging to a simple phrase, creativity is best produced when faced with strict limitations. 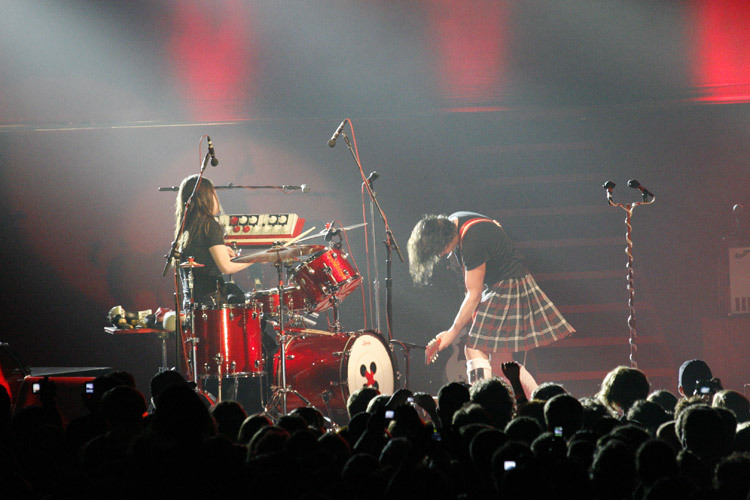 The White Stripes only have two members, limited color scheme and (for a while) only used analog equipment. True creativity is born of a struggle of some kind. Build a strong framework you believe in and the limitations will empower you. Put a deadline on that meeting. Limit that product to only three features. Constrain. Ship the damn thing. During its entire lifespan the White Stripes never signed a contract where they would not own all of their content. This resulted in the self-publishing of their first two records. The success of the first albums enabled the group to negotiate favorable contracts for their rest of their career, including a one-album deal with industry giant Warner Brothers. In fact, all of the band’s contracts were short-term arrangements. We’ve seen this tactic employed by Bill Gates with much success when it came to DOS. Owning your work is an important long-term strategy for any creative product. However, this Jobsian-like control can extend to the manufacture of the product itself. The reason Apple can innovate hardware and software simultaneously is that it remains tight fisted over the entire production process. So when Jack White transitioned from rock star to a record distributor he made sure to retain control over all processes. Indie Nashville takes a tour through Third Man records and the vinyl factory nearby. The White Stripes contain no more elements than needed. This serves not only as a gimmick but a way to keep costs laughably low while streamlining the entire operation. White often says that this simplicity also gives him nothing to hide behind, forcing him to put on a good show. Some people choose the profession they are in because they like the idea of that occupation more than the actual practice. In journalism, this disconnect was possible until the digital disruption. Yet journalism professors often tell me that their students are still chasing the romanticized ideal of a journalists, the archetype made possible in All The President’s Men or Good Night and Good Luck. But we can’t ignore our the business realities and we must do what we can to learn the business of content.